California Navigation & Improvement Co.
W. R. Chamberlain & Co.
Cleveland & Buffalo Transit Co.
Crescent Towing & Salvage Co.
A Great Lakes Line. Flag blue with the inscription in white shaded letters C&B Line. Quarterly red and blue, overall on a white lozenge a red "C." I have also seen the blue quarters shown in black.) I believe but am not sure that I once sent this flag to the list before, but include it here for completeness. This firm apparently was the shipping division of the Cleveland Cliffs Iron Company. A photo of this flag can be found here or (enlarged) here. This version appears to be somewhat longer and has a larger diamond comparable with the one at the head of this page, which is part of a site about the company’s last ship, the ‘William G. Mather’. Its flagship sailed from 1925 till 1952, and it stopped operations in 1980. Other vessels, active as well as non active, were sold off starting 1985; end of 1987, the ‘Mather’ was donated to become a museum ship. More on Cleveland-Cliffs (ore) company history, including shipping can be found at http://www.cleveland-cliffs.com, with, about half-way down the page, a close-up of the house flag. It is still used as a trade mark. 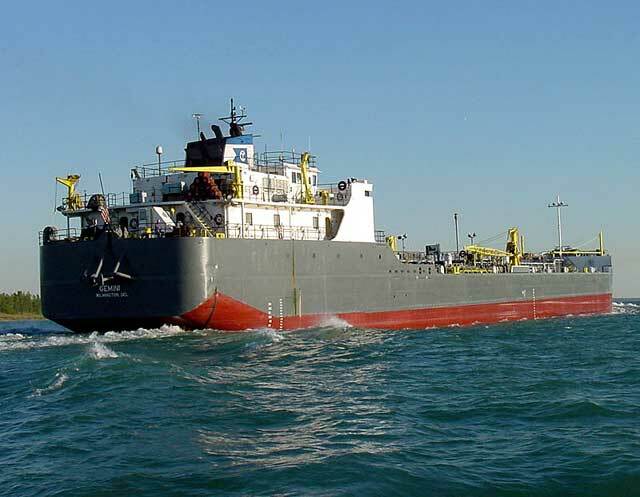 Despite the homeport, a company specializing in oil tanking on the Great Lakes. Many US companies are incorporated in Delaware because of lenient incorporation and tax policies (if any lawyers in the crowd understand this better than I, please pitch in), so you'll sometimes find shipping companies giving Wilmington as the port of registration rather than the port where the ships really operate from. The flag is a quasi-monogram of the letters C T in wihte on a blue swallowtail. The Cleveland Tankers house flag is shown here (second row, third picture) and enlarged here. The flag on the photo is of a different blue; it tapers. The ‘CT’ (the ‘T’ sitting snugly inside the ‘C’) monogram is situated near the hoist. The house flag can be seen in action at http://www.boatnerd.com. A new company, “Cleveland Tankers (1991) Inc., Cleveland, OH. (…) was 75% owned by U.S. citizens who were partners in the bulk shipping consulting firm Jones, Bardelmeier & Co. Ltd. of Nassau, Bahamas; and 25% owned by Algoma Central.” There was also the Cleveland Tankers Ship Management Inc.
A Great Lakes line formerly serving Buffalo and Toledo. Flag was a red burgee-shaped pennant with a white disk bearing a green four-leaf clover. Clyde Steamship Company, Incorporated, New York; triband blue-white-blue, proportioned 1:4:1; in the center a red "C". east coast ports. The headquarters moved to New York in 1872. Besides connecting the northeast and southeast, the line also served the West Indies, especially Dominican Republic, after 1870s. The company was purchased in 1907 by Charles W. Morse's Consolidated Steamship Lines, which collapsed in 1908. Clyde Line was then taken over in 1911 by the Atlantic, Gulf & West Indies Steamship Lines, a combine of a number of lines, but the Clyde Line name and flag continued in use until 1932, when Clyde was combined with the Mallory Line name to form the Clyde-Mallory Line. Flag: white with blue upper and lower ed! ge! s and a red "C" in the center. Sometimes shown with serifs. A combination by the Atlantic, Gulf & West Indies SS Lines parent company of the old Clyde Line and the old Mallory Line. Clyde-Mallory existed for only 17 years; it was sold to the Bull Line in 1949 and the Clyde-Mallory name and flag went out of use. The flag combined the white with blue edges of the Clyde flag with the red star that appeared on the Mallory flag. Note: [gsh34] shows this flag trapezoidal, but company memorabilia depicted on steamship.net indicates it was rectangular. A trapezoidal version of this flag is currently on FOTW at gb~hf02.html, but this was an American, not a British, company. Clyde-Mallory Lines. The correct version is not tapered. The only source I have seen showing a tapered flag is the National Geographic Magazine of 9/1934. Flag divided from lower hoist to upper fly, white over blue, with the letters "C" and "L" counterchanged. Coleman's was one of the clipper ship lines that sprung up in the 1850s to meet the demand for transportation from the east coast to the gold fields of California. At the Alaska's Digital Archives website was an image of a canned salmon label with some vex interest because it shows two flags for a label of Coleman Flag Brand Red Salmon. One bears a seal showing the flag of the Alaska Packers Association, although the proportions and shade of blue differ. It also has a flag or flagoid- the eponymous Coleman Flag no doubt - red and blue divided per saltire (red at hoist and fly, blue at top and bottom), with a white disk in the center, bearing a large black C (with serif). Edward K. Collins joined his father's shipping business in 1821 and struck out on his own with this line of sail packets between New York and New Orleans in 1837. The flag was a red swallowtail with a black "L" on a white disk. Known as the "Dramatic Line" because the ships were named after Shakespeare and other dramatists and actors. By the early 1840s, his shippng ventures had made Collins won of the wealthiest men in New York and the most successful shipowner in America. All the ships were sold in about 1850 to shift service to steam with the new Collins Line. The flag was divided blue over white with two counterchanged Ls. The Collins Line operated from 1850-1858 and may have been the most famous American steamship line of the 19th century, but it was afflicted by a series of disasters, high operating costs, cancellation of government subsidies, and failure to keep up with British technical advances. The line's first flag was a blue swallowtail with five rows of six white stars each, very similar to a pre-Civil War US Navy commodore's broad pennant. The second flag, reconstructed here from a description in North Atlantic Seaway I:201 was blue with the US shield outlined in white, tilted toward the upper hoist. My copy of Bonsor has a different version for the second flag making it a burgee, as with the first flag, and with no mention of the shield being angled. Flag #679 on National Geographic (1934). A subsidiary of the Atlantic, Gulf & West Indies combine, serving ports on the US east coast, Colombia, and the Caribbean. Combined into AGWI's other operations in 1938. Flag a blue swallowtail with a red C on a yellow lozenge. Based on http://www.timetableimages.com/maritime/images/colon.htm, the flag of the Colonial Line or Colonial Navigation Co., document dating from 1934. The flag image is very small and seems to consist of a red ring on a white field. There’s eBay, however, offering a jug (Item number: 2244114503, bidding closed) of this line showing the company flag. If the brochure’s colours are right, the flag is white with a red disk bearing a white ‘C’ and a five-pointed star in each corner, possibly also red. This button, found on the "Nautique" website seems to indicate the stars were blue and the C dark coloured. This picture showing a house flag is a fragment of a poster shown at http://www.trainweb.org/panama/misc/columbian1894.jpg. Apparently New York and San Francisco, and the ports between them and the Panama Canal, were served by this company. The Panama Railroad Co. must have played its part as well. The house flag is light in colour and has a thin, dark-coloured saltire plus the US shield (with stars?) in the centre. If the poster was from 1894 as the file name suggests, then the Panama Canal would not have been involved, as it did not yet exist. The part played by the Panama Railroad company would have been to transport the passengers across the isthmus from Atlantic ports to Pacific ports. According to a message posted here "The Columbian Line (1894-1895 with New York - Colon service using chartered ships) became the Panama Railroad Steamship Line in 1896." An image of the logo of the Panama Railroad Co. postdating the 1903 establishment of the Republic of Panama looks very similar to the emblem on the saltire of the flag you mention, with the addition of a chief based on the Panamanian flag. See http://www.trainweb.org/panama/misc/prr-logo.jpg. 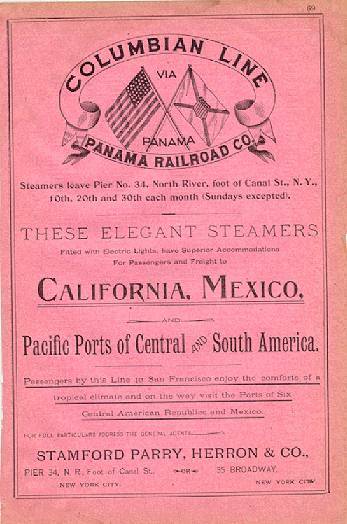 There are already images of the houseflags used by the Panama Railroad Steamship line here. In 1949 it had one cable repair ship of 3,000 gross tons. Flag diagonally red over blue, with the company initials in blue on a white band from lower hoist to upper fly. Another California clipper company. Blue over white burgee with a red hoist, and thereon a white C.
The ports of Baltimore and Norfolk were (and are) the principal shipping points for bituminous coal mined in Pennsylvania, West Virginia, and western Virginia. This company's flag was a red-white-blue vertical tricolor with the initials CCC on the three stripes in black letters. Lloyds 1904 shows the blue band as being red. Continental Oil Co., Houston TX - white flag, rounded red outlined rectangle, charged with red "CONOCO". "ConocoPhillips: From their beginnings in the early days of the oil industry, Conoco Inc. and Phillips Petroleum Company grew and prospered, becoming leaders in the global energy industry. 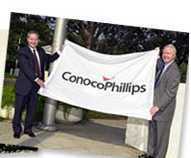 On August 30, 2002, they combined their complementary strengths and shared values to create ConocoPhillips." Apparently an earlier flag of the Cosmopolitan Line. This flag has the initials CL in red on a white disk on a red swallow-tailed field. Cargo service from New York to French ports; operated the America-France Line with US government-owned ships from 1919-1939. Later operated the Southern Cross Line down east coast of South America. Abandoned US flag market and switched to Norwegian flag vessels in the 1950s. A pretty effective flag: red with a white bordered blue lozenge. The name similarity may only be coincidence. Lloyds 1904 shows the flag for the company being operated by P. Wright & Sons and based Philadelphia and New York. Lloyds 1912 does not show it and there is thus a gap between the 1909 Flaggenbuch update and the 1916 date given for the formation of the 2nd company. Crescent Towing & Salvage Co., Inc., New Orleans, LA - green burgee, white "CTS". The Cromwell Line was established by H.B. Cromwell and a group of Georgia investors to serve Savannah and New York. It was seized by Federal forces during the Civil War and began New York-New Orleans service after the Union capture of New Orleans in 1862. Taken over by the Southern Pacific Railroad Co in the late 1880s but continued to operate under the Cromwell Line name and flag until 1902, when all Southern Pacific properties were consolidated under the flag of the former Morgan Line. The flag was simply a white C on a red swallowtail. Curtis Bay Towing Co., Baltimore, MD. - white flag, blue diamond, red "CB"; along top "CURTIS BAY TOWING CO."; along bottom "Pennsylvania". - San Francisco-Sydney and Melbourne (1862). The house flag is red with a white disk bearing a black serifed 'C'. Blue burgee with a white lozenge bearing a red C. The flag is pre-1929 when this company was bought out by United Fruit.